This NCLEX review will discuss Rh incompatibility in pregnancy. In your maternity lecture class you will most definitely learn about Rh incompatibility and how it affects the baby. This condition does NOT cause harm to the mother but the baby. Don’t forget to check out more maternity NCLEX reviews and the free NCLEX quizzes. It occurs when an Rh-positive father and Rh-negative mother have an Rh-positive baby. The baby’s blood will enter into mom’s circulation at some point causing her to create antibodies that could attack the child. It mainly affects the child of the second pregnancy and onward because of the antibodies that were created in the first pregnancy. These antibodies tend to be created after the delivery of the first child. However, there are circumstances that the child of the first pregnancy can be affected as well (more about that below). Why does it matter if the mom is Rh-negative and the baby is Rh-positive….what’s the big deal? Think back to our review over the various blood types and Rh factor. We learned that people who have these special proteins, called Rh factor, present on their red blood cell surface are known as being Rh-positive, but people who do NOT have the Rh factors present on their red blood cell surface are known as being Rh-negative. The big deal is that people who are Rh-negative blood (Rh factor is ABSENT from their red blood cell surface) can ONLY receive other Rh-negative blood. They should never receive Rh-positive blood into their circulation because the body will create antibodies and ATTACK the Rh-positive red blood cells. However, a person with Rh-positive blood CAN receive both Rh-negative and positive blood without any problems. So with that in mind, if the baby’s blood (who is Rh-positive) mixes with the mother’s blood (who is Rh-negative) the mother’s body will create antibodies that will attack Rh-positive blood…hence attack the baby’s RBCs. Remember that since she is Rh-negative she should ONLY receive Rh-negative blood in her system. So, if the baby was Rh-negative it wouldn’t matter OR if the mother was Rh-positive and the baby was Rh-negative it wouldn’t matter as well because the mom can receive BOTH Rh-positive and Rh-negative in her blood. When does this mixing of blood occur, and why does this condition affect the child of a second pregnancy and onward? Mixing of blood: It most likely occurs during delivery when the placenta is detaching….therefore, the child of the first pregnancy is gone and not present for the antibodies to attack their red blood cells. However, a child of a first pregnancy can be affected if the mother has some type of complication like abruptio placentae etc. or invasive procedure like amniocentesis etc. The baby will still be in the womb for the antibodies to attack. Second pregnancy: Rh incompatibility will occur during the second pregnancy IF the child again is Rh-positive (this won’t be an issue if the child is Rh-negative). There is a high probability of this happening if an Rh-positive father and Rh-negative mother have another child. Let’s say that a mother who is Rh-negative had an Rh-positive child and did NOT take any preventive measures to prevent her body from creating antibodies (hence she didn’t receive the RhoGAM shot…more details about this below). 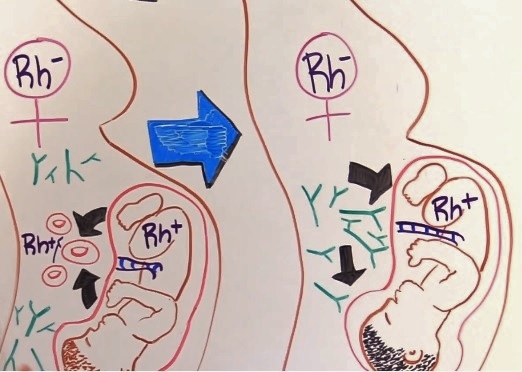 Therefore, she became SENSITIZED after the delivery of the baby, which means she has created these Rh factor antibodies that will ATTACK Rh-positive RBCs when they see them. The first baby has been delivered safely. Now, the mother becomes pregnant again and the child is Rh-positive. The mom now has in her body antibodies that will attack Rh-positive red blood cells. A neat thing that occurs during pregnancy is passive immunity. This is where mom is giving her baby antibodies so the child can survive after birth. However, the issue with this is that the mom is also passing these Rh factor antibodies as well, which are entering the baby’s circulation and ATTACKING the child’s red blood cells. As a result, the child’s RBCs will experience hemolysis. The child’s red blood cell count will fall, which leads to severe anemia. What is the role of RBCs? To carry oxygen throughout the body to organs and tissues. Since the child is losing RBCs and experiencing anemia the body will suffer from low oxygen levels. The heart will then try to compensate by increasing its contractility and work harder. Unfortunately, the heart can only take so much until it becomes exhausted and weak. The child will then enter heart failure and fluid will build up in the body, which will lead to edema (why the baby will be swollen). The spleen, along with help from the liver, will try to make more red blood cells but the RBCs will be immature. This will cause the liver (hepatomegaly) and spleen (splenomegaly) to swell. Now, what happens when red blood cells lysis/breakdown? They leak bilirubin in the blood and the liver can’t conjugate it fast enough. Bilirubin is a yellowish brown substance and it will leak into the tissues.Therefore, the baby will experience JAUNDICE. Furthermore, bilirubin is neuro toxic and if the baby has too much bilirubin in their system for a long amount of time this can affect brain development. The key with Rh incompatibility is PREVENTION…..preventing the mom from ever becoming sensitized in the first place. How is this prevention done? The mother’s blood type will be assessed…if Rh+…needs nothing….if Rh- will need a RhoGAM shot at 28 weeks and then within 72 hours AFTER delivery of the baby if the baby is Rh+ (baby will be checked). How does RhoGAM work? It stops the immune system from creating antibodies against the baby’s Rh positive blood. Given intramuscular (IM)….if mom already has the antibodies created RhoGAM isn’t effective.